It’s Friday! 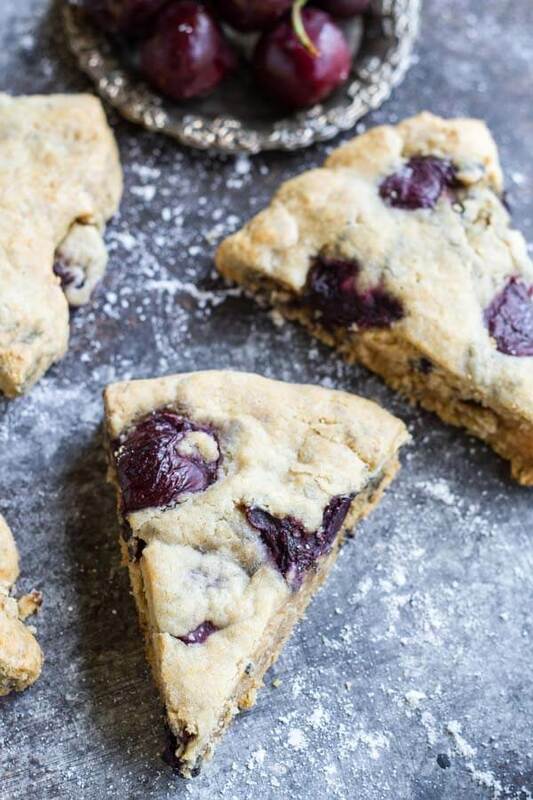 And I’m rolling into the weekend with these flaky, buttery scones bursting with fresh cherry flavor. Confession time: I’ve actually never been a huge fan of scones. I always thought they were dry, boring biscuits not worthy of eating. But recently I had a gluten free scone at a local bakery that was loaded with fresh cherries, marzipan and lemon. OMG! I was completely wrong about scones. So obviously I have some catching up to do here on the blog. I need some fabulously amazing scone recipes, like RIGHT NOW! Come to find out, scones are pretty easy to make. The secret is to make them as buttery as you can. And flaky. And crumbly. And don’t forget about the fresh fruit. I have lots of different gluten and grain free flours in my pantry. I opted for a mix of cassava flour and arrowroot powder. I find cassava flour a great substitute for traditional flour when it comes to texture. I used real, organic, grass fed butter. But you can use ghee as well. I highly recommend grating your butter with a cheese grater and placing it in the freezer for a few minutes to get it nice and cold. fresh cherries. Fresh fruit in scones is the BEST! 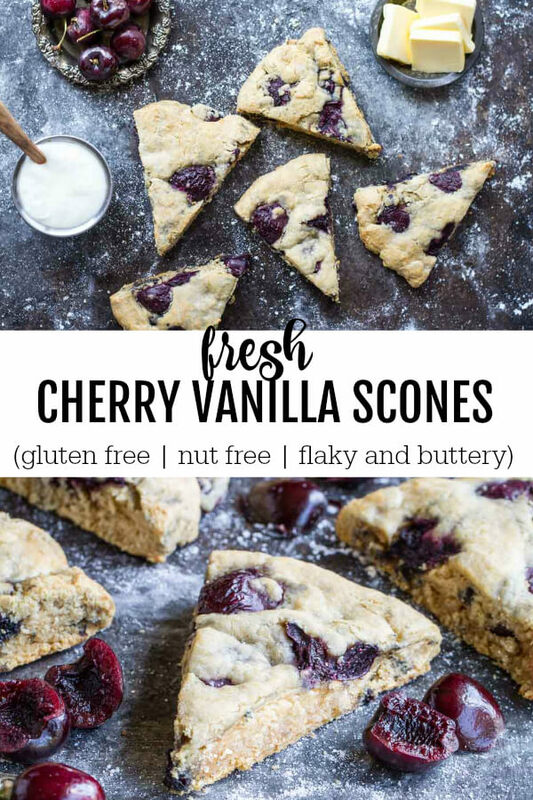 Imagine every bite of your perfect cherry vanilla scone bursting with juicy flavor. Honestly, I’m in love with these cherry vanilla scones. They make me very happy. And everyone who had one agreed they are legit scones, moist flaky, and crumbly all at the same time. The biggest compliment came from a friend’s mom who happens to be British. She said the texture was just like a real English scone. I think I’m winning at scones today. Make them for brunch. Have one for dessert. Have one for a delicious little snack any time of day. Just have one!! In a large bowl, whisk together eggs, yogurt, maple syrup, and vanilla extract. Set aside. In a food processor, pulse together cassava flour, arrowroot, baking soda, salt, and grated butter until you get a coarse crumble. Add dry to wet. Gently mix until fully combine. Very gently fold in cherries. 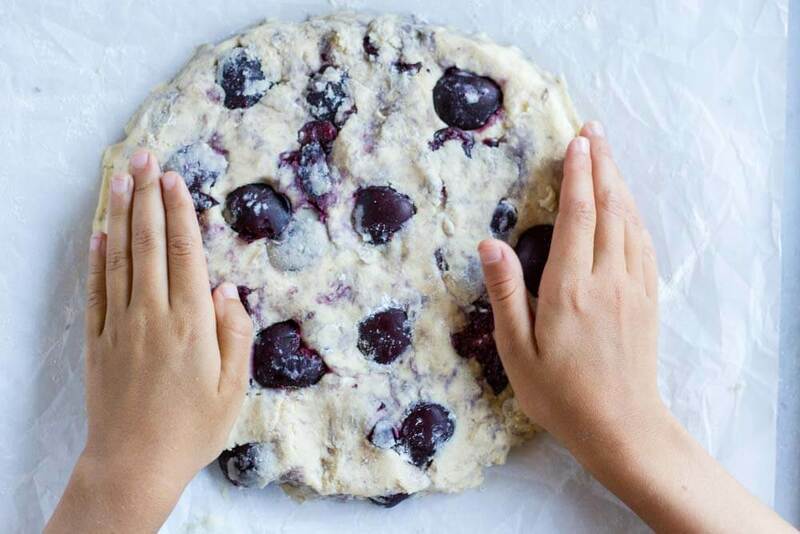 Turn the dough onto a floured surface and pat into 1-inch-thick circle. Place into freezer for 15 minutes to chill. While you wait, preheat oven to 400’F and line a baking sheet with parchment paper. Remove from freezer and cut dough into 8 even slices (like a pie.) Arrange pieces, about 2 inches apart on the prepared baking sheets. Brush each piece with milk of any kind. Bake for 16-18 minutes, until golden brown, rotating baking sheet halfway through. Enjoy!! to grate butter, simply use a cheese grater. I like to put grated butter in freezer for 5 minutes to get it nice and cold again. If using ghee, use cold ghee and chop into small pieces. Yes, you can sub tapioca flour for the arrowroot powder. 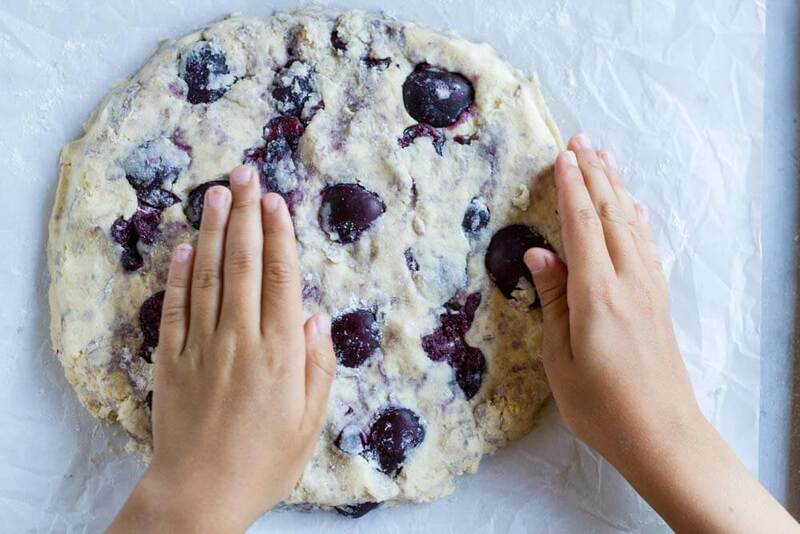 I recommend patting your cherry halves dry with a paper towel before adding to dough. 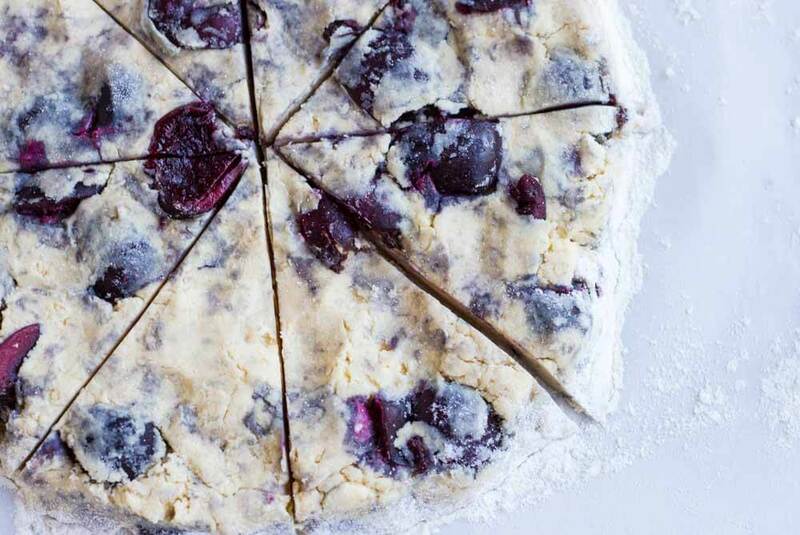 This will keep your dough from turning purple from all that yummy cherry juice. My goodness these scones look incredible! I love scones but haven’t made them in years and I’ve never had them with cherries. That is brilliant! I can’t wait to try some. I’m new to scones and am loving them. These look so perfect! Would love one for breakfast. They taste so good with a hot cup of morning tea. 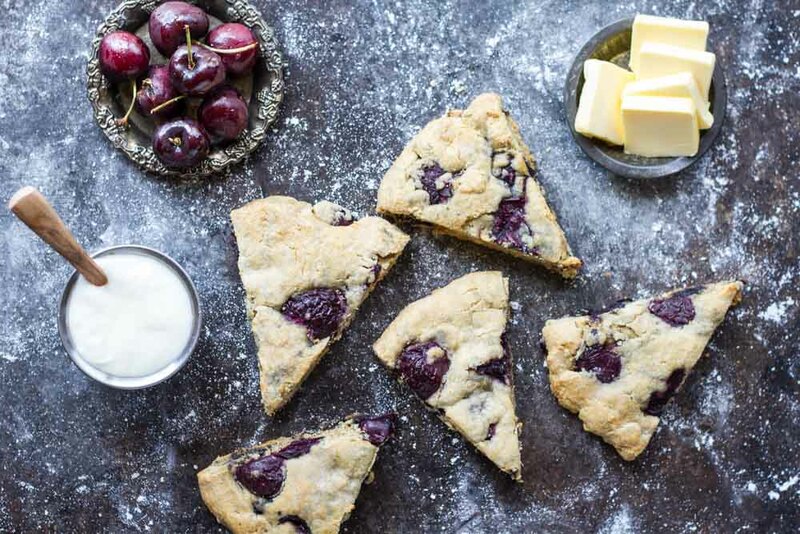 I love scones and cherries so this is my kind of dessert for sure! Can’t wait to make it for an afternoon tea someday. I purchased some pretty amazing cherries yesterday…I tell ya…summer is glorious for all it’s in season goodness!! 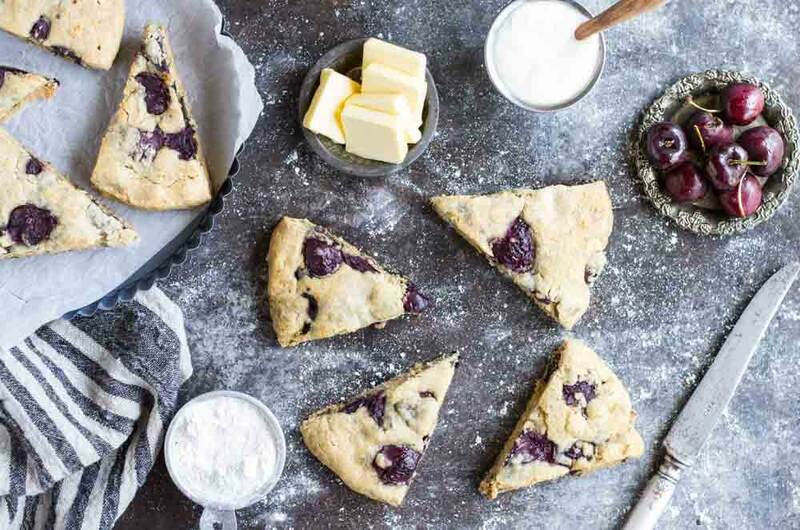 Scones are amazing…and cassava flour makes them taste like original! Yum! I agree, Tessa! Nothing like the abundance of summer fruit. We are right in the middle of cherry season here! I can’t wait to make this this weekend! thank you! Totally in love with the flavor combination of this recipe. Love that it’s grain-free too ! 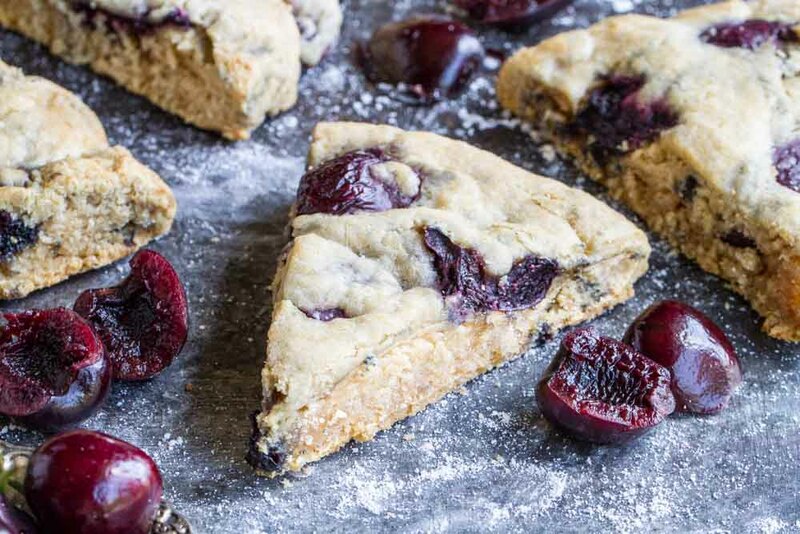 Cherries are my favourite fruit to bake with and these scones look just utterly delicious. I need to grab me some cassava flour stat! These are gorgeous! I am making for sure! These look like the perfect use for the pitted cherries in my fridge! I completely agree, scones are just not worth it unless they’re nice and buttery! Our local cherry season is just starting so I can’t wait to make these! These look absolutely yummy! Love cherry vanilla combo. These look so delicious!!!! I can’t wait to try these. 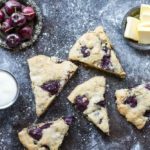 I am a scone addict and I am so excited to try this recipe! Thanks Katja! !